Activities to practise different ways of expressing possession (possessive adjectives, possessive pronouns, possessive case). Worksheet to complete the clauses with the correct relative pronoun or adverb with a short grammar explanation. Two texts to conjugate the verbs in the past simple or past continuous in context. 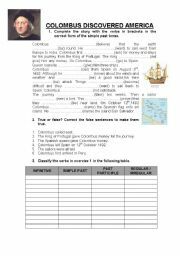 A worksheet to practise the past simple tense and learn some cultural tips about Columbus discovery. 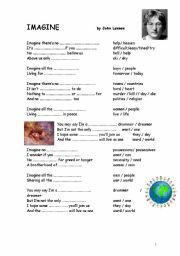 It´s a worksheet to practise present simple tense through a reading comprehension activity using the biography of the popular singer Shakira. 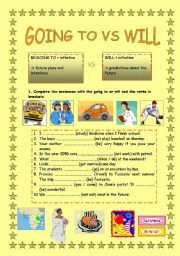 A worksheet with an exercise and a basic grammar explanation comparing going to and will. Two tasks to practise past simple and a writin exercise. This worksheet contains different revision activities: verb tenses (present simple vs present continuous, past simple vs present perfect ...), adverbs and time prepositions used with the present perfect. 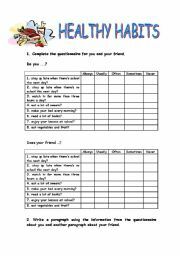 This is an speaking activity to do in pairs to practise questions in the present simple tense and talk about healthy habits. A grammatical explanation with examples on defining and non-defining relative clauses. It´s a theorical explanation of the different types of conditional sentences and the "I wish" structure for upper-intermediate students. This is a grammar explanation of the conditional sentences and the wish structures. It´s the theory part of the comparative and superlative structures. The activities are in another power point. Explanation with examples of the conditional sentences in a power point presentation.